Yesterday we reported about the decision by the French government to abandon plans to build an airport in Notre-Dame-des-Landes. Today we publish an open letter by Some squatters of the zad (Monday, January 15, 2018). Originally published by Squat Net. We are witnessing these last weeks a stream of media statements about the zad in Notre-Dame-des-Landes, France, and its future – airport or not, evictions or not, new Larzac or not, blah blah. Suffice to say that we do not necessarily find ourselves in these statements, or not at all, or our ideas are on the contrary. Some feedback lead us to believe that it is not always very clear, for the members of the local committees, the supports and the sympathizers, especially those who are far away, geographically, from the zone. This letter is addressed to you, because we want to explain what we understand about the situation, and also to carry a different voice than those most heard in the media. WE, we are a bunch of inhabitants / squatters, of different places of the zad, who do not always have the same positions, but often meet on the common ground that the zad retains a certain radicality which is not only of image, keeping it a place where everyone can find their place in what is happening there. During the past year, relations between the various components of the movement against the airport and the squatters have not been simplified. It was more a time of tension, on the bases of mutual misunderstandings and / or political disagreements. Some, however, continue to maintain and build bridges between these realities that rub against each other and clash. It’s more than complicated, and at the same time exciting. We would not trade it for anything in the world with a boxed in life. But it imposes us a lot of questions we’d like to share, and it’s hard to tell all that without going into details. Even if these frictions are not new, the prospect of abandoning the airport, which seems to be suggested by the mediation report, puts additional pressure around these conflicts. Yet the challenge of thinking together about the future of the area remains fundamental for many. 1) a few months ago an “assembly of usages” was created following discussions about the future of the occupied land. People from different components, committees, associations … participate every month. It has set itself ambitious goals: on one hand to discuss / manage the use of the common spaces on the zone, on the basis of “the six points”, the different practices that exist there, and the conflicts which can possibly result from it ; on the other hand to think about the future of the zad after the abandonment of the project of the airport. Within its structure, a structure with commissions was set up handling different subjects. These commissions work on more or less specific questions, and report their work in the form of proposals back to the assembly of usages. The components then discuss them “internally”, and report their agreement or counter-proposals on the next assembly to take a decision. These new structures meet the expectations of some of those who consider it more “efficient”, and some forms of fatigue / burn-out related to the difficulties of moving forward together. We would like to try not to fall back into the same trajectories as elsewhere, in terms of confiscation of speech and separation of decision making of those concerned, in short, seizures of power, and it is a difficult challenge to hold. Reflecting and deciding together requires time, and therefore also an ability for getting out of the agenda imposed by the state. For some of us, the diversity of the expression of the squatters was already struggling to express itself in the general assembly of the movement, and the assembly of usages does not solve this problem. For others, it still seems important to try this form of organising in the light of what is coming, while keeping these questions in mind. 2) On the other hand, things have also happened within the occupation movement. The general meeting, weekly on Thursdays, was so far the only common assembly space for discussion between the squatters. But between the time consumed by the organization of the daily activities and the time needed to find agreements on the extent of our diversity, it became difficult to discuss really complex subjects. The squatters therefore decided to create a monthly “general assembly of the occupation” to continue these substantive debates. In recent periods, we often hear about the “opportunity to negotiate” (between the state and the anti-airport movement). A lot of people (committees, supports, etc.) seem to be asking questions about this. 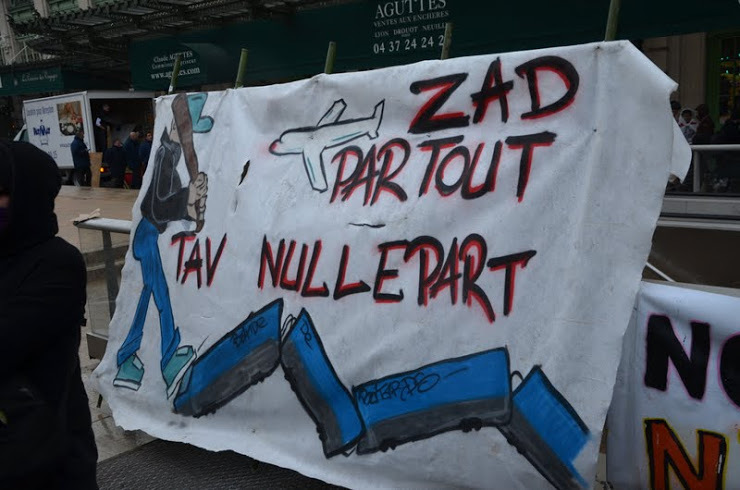 It was decided, within the framework of the “assembly of usages”, to form an “intercomposing delegation”, whose mission would be to negotiate with the state about the future of the zad without an airport. For many of us, it seems important to remain united facing the state, while the state does everything to divide us between good and bad, integrable and repressible. That is why, after difficult debates, it was decided that squatters would participate in this delegation, particularly because the other components will go anyway. Many of us do not agree or expect much from it, because in the face of the state, we only win what we can take and hold by the struggle, not what it wants to grant us. But in such a critical moment, we certainly have an interest in seeing and knowing what binds us and that has bound us in the past years. It is beyond the fight against the airport that we hope to find this cohesion, among the squatters and between components of the movement. We do not want to believe that within this key moment, that some people are calling “victory” and others “the abandoning the airport”, our movement would be disintegrating and we would be fighting each other for a share of the pie, whose cherry would be the agreement of the state. On the contrary, we wish to signify to the state, as well as to those that our movement scares, that together we are not only obstacles to their projects, but obstacles to their logic, with or without an airport. That, through these negotiations, the state will have its grip on what will happen here, is a fact. But that does not mean that we open wide the doors of what we have built together and without it. It is and will remain, for us, a political enemy, and we will continue to build our own realities. Since the feedback of the mediation, the media are all over us. LCI headlines one of its reports, January 4: “Zadistes: terrorists like the others?”. The excess has no limits, it mixes and confuses everything, to create a big beautiful image of fear. Because fear sells clicks (or paper), and it makes people still vote a little bit more on the right in the next elections. The media, as the second thick skin of an already established system, has already launched the offensive, and attacks from all sides by playing with all the tools at their disposal: lies, bad faith, misinformation, fragmented and decontextualized information, caricatures, stolen pictures, assumptions, prejudices … Classics, and especially to magnify the buzz and the sensationalism. Most of the “infos” posted on Notre-Dame-des-Landes are either unsourced communiqués from the police or gross manipulation. For the state and its representatives, inciting editorialists without any knowledge of social struggles to report subversive movements as terrorists, is a usual plot for the designation of an internal enemy. A very practical diversion in the agenda of social cleavage, which allows it as a bonus to use a judicial arsenal to monitor, hinder or muzzle activists. In short, to legitimize its own violence. Indeed, as we have seen, freedom of expression borders on blurry notions of terrorism. The semantic shift from “convinced activists” to “terrorists” to “radicalist” is particularly pernicious. Although this diabolisation has no legal basis, it greatly facilitates the repression and surveillance of protest movements. So, yes, they will try what they can to weaken this movement: manipulation of opinion, police operations and various other spooks, … But above all, they will seek to inflame our differences to better divide us. On the other hand, when other writers draw a smooth, integrable and apolitical portrait, we do not thank them more than those who criminalize us. The zad has nothing to do with the images of an entrenched camp with dangerous idiots, conveyed by the media to hide the political background of what is invented here on a daily basis. However, life on the zone is not a postcard of gentle neo-rurals in wonderland. As everywhere, there are conflicts of usages, confusions, slippages. But here we are trying to deal with these issues collectively, without the use of cops, judges, prison guards or psychologists. We put a lot of energy into it because we believe it is possible. What some call a “zone of lawlessness” is for us an area where some of our structures are thought out, discussed, questioned daily, and subjected to the test of different realities. It is their laws that punish the poor and protect the rich, their laws that outlaw and suppress solidarity, undocumented people, free housing and so many other things. What they call “non-right”, we call it “outside-of-the-norms”. And it is not legality or illegality that seems for us a criteria for judging the rightness of our actions. The invention of a social model in constant experimentation is sometimes chaotic and inevitably imperfect, but it is a legitimate attempt even if it jars with established frames and norms. And this collective experience, lived, sustained and joined by thousands of people over the last decade, gives hope and meaning in a time when capitalism ravages what is still breathable in this world. That’s why we will be many to defend the zad in case of police intervention, targeted attacks or total eviction, as we did in 2012. We know that like then, the fight will not be played only in the perimeter of the zad but within the constellation of links, likeminded struggles and support, for some established since years. And despite in having to face the asymmetry of forces announced (3000 COPS? 6000?!! ), we will resist together; the best we can with all the tools and modes of action available to us. Because our strength has always been this complementary diversity, which infuriates those who want to separate the good protesters from the bad. Let us never forget that violence comes and always will come first from the system and from the state that defines its degree. The government thus prepares the public opinion for an eviction with extreme violence, perhaps going as far as murder, as in Sivens, with the help of the media, which nauseatingly repeats the policelike remarks about “the possibility of a dead person”. While the state suggests that it could abandon the project, some people more or less distant from our reality reveal in the media their plans for the zad. We did not wait for them to think our future. The state and the system it defends take us straight into a wall, and rather than contribute to the current disaster, we feel legitimate to try to live differently here. As agreed with the movement as a whole, we want to freeze the land situation once some of the local historical rights are restored, in order to create an entity resulting from the movement that will support these commons. One can often read or hear that a zad after abandonment would return to its purely agricultural vocation like before the project. Although this struggle was from the very beginning a struggle for the defense of the land, it has since been enlarged, especially with the arrival of the squatters. People live and struggle here, have developed other practices over the years, and intend to continue. No offense to those who want to develop a peaceful fair trade, we want to continue to cultivate and / or live, outside the box and beyond standards. We also want to continue to invent other ways of sharing and exchanging outside the singlular capitalist market structure, to be less dependent on the state and the market, but also for our neighbors and to support other struggles. We also want to continue to define our own rules and manage our conflicts. We have no prescriptive answer on how to live differently in this world, for the contradictions that go through us, and the compromises we are ready or not to accept. We want to take care together of the common spaces (roads, wooded areas, meadows, meeting places …); working to strengthen the bonds of trust that already unite us with our neighbors, and to deconstruct the prejudices and fantasies that separate us from many of them (notably through the organization of info-shops in the surrounding neighborhoods, participation in the revitalization of the neighboring village …). However, we do not want a zad where only those could remain that would present well in front of the journalists, would accept to take a legal status or could / would pay bills. In other words, those who would not look good on the family picture. We want the zad to remain diverse and surprising, with people with different practices cohabiting because they are attached to different political ideas. We have defended this area together, we will continue to live together. We want everyone to stay, without exception. Some may leave, others will come, others will just pass, like it always has been the case. And make sure that there would be no eviction or any form of police intervention aimed at repressing some of us. We also think of all those who have already been repressed. We want amnesty for those convicted in the fight against the airport. We are ready and determined to fight for all that. Finally and perhaps most importantly, we want the zad to remain a zone of struggle. Together, we have liberated these lands out of their planned destruction, have put in place forms of living that corresponds to us, collective and autonomous forms and we do not want to stop there. We are fighting against the airport and its world. And even if the project is abandoned, its world will continue to exist, and we will continue to fight it in any way we think is relevant. We will continue to fight against infrastructure and major useless land projects; against migration policies and state racism, alongside those who suffer more than us from systemic violence. We will continue to take the streets, to occupy buildings and public places with the workers, the unemployed, the students, the poor (which is us sometimes) against the capitalist policies that put us more and more at the mercy of the economy. We will also continue the work for the deconstruction of oppressions that cross our society (sexism, racism, specism, ageism …) by visibilizing and fighting them, on the zad and outside. While the movement is considering the sad game of negotiations with the state, we hope to succeed in preserving together the spaces of freedom that makes the zad an area that is a little bit more breathable than the rest of the world. We are not at all sure of winning this bet, but we prefer to try rather than to be divided. As for the part of road of the D281 that crosses the zad, the so-called “road of chicanes”, it is again a centre of attention. Voices are raised in the media (sometimes coming from the movement) to claim its “opening” (normalising), even as its “liberation”. The least we can say is that there is no consensual position on the subject. Since its (re)birth during “Operation César”, it has been the scene of political conflicts, about the usages and / or the neighborhood, and we are having difficulties finding solutions that are suitable for everyone: inhabitants, squatters, farmers, neighborhood residents and other users, or other components of the movement. We do not have the same evidence or the same interests. We are also conscious that some people do not dare to take this road any longer, or are frightened because of the the well-known stories, which can sometimes be a rumor or very exaggerated. It is clear that there have been abusive acts and behaviors on this road, to which the occupation is not always able to react adequately. But we can not reduce the debate or conflicts on the subjects of the road to these acts. Beyond our difficulties to find a sustainable form of existence to this living road, what is disturbing to some is also the idea of a common space whose autonomous management escapes the places of power. Many agglomerations are equiped with speed bumps, areas where traffic is limited or reserved for local residents (or even totally privatized). Yet rarely does one see so much ardour in challenging the existence of these provisions. Defense and protection for opposing the state are no longer the only stakes in the occupation of this road. We know that a barricade does not stop a bulldozer protected by cops, not for long in any case. However, our attachment to this road does not belong to a “barricade folklore” to be swept away with one hand or to make a museum(even tho some of us really like this carcass of a rusty car with the tag REVOLT on it, where there is a self-organised wild flower bed). On the contrary, we attach a strictly political importance to the future of this space and what is played out there: The questioning of the speed, of the place that the car takes in our lives and on the territory, and finally of a certain vision on the functionality of the space where the usage is decided from above rather than locally on the ground. These questions will always be relevant after a hypothetical end of a police threat. For many of us, this road is also a part, small but vital, of this struggle for imagination. That is why if this road becomes again a normalised road, to the detriment of all the praxises that have been created on there since the last 5 years, a part of the movement would experience it like if it was the beginning for normalisation of the occupied zone. We know that having so many realities coexist requires commitment, energy, prominent action. We have already met each other to ask ourselves this question collectively and we will continue to do so. Conflicts about usages and politics are often considered here as the pinch of salt for this space. And even if the excess salt makes us pull out the tongue sometimes, a savourless plate does not tempt us. As you probably know: whatever the government’s decision, we invite you to join us on the zad on the 10th of February to celebrate this victory if the abandonment of the airport is acted, or to hasten the invitation if it would be the opposite case. We are waiting for you to prepare the aftermath, making sure to leave room for what has made us strong so far: the coexistence in the same fight with many cultures of struggle that mutually complement each other, this diversity that leaves no angle of attack for the government. The links that are woven within this struggle, form a frame that would disappear if it was the end of the zone to be defended. Let us come out strong from this common past to build the rest of this story, to continue our search for a more just and a more commonly thoughtful world, to preserve those connections that have deeply impacted our lives and that will multiply further. The zad will live, not because we are “fifty ultra-violent irreducibles”, but because we are thousands who have a strong attachment to this place, for thousands of reasons. And that will not change with the abandonment of the airport. As in Bure, No Tav or in Roybon this airport project is only a symptom of a society in deep crisis, at once economical, political and social. Symptoms that others try to answer by welcoming refugees, seeking a respectful agriculture with the living, or radical feminism (among a thousand other struggles that we should mention here). This world is full of oppressions and inequalities, and if the idea is not to throw it completely in the trash, it is at least to cause deep and radical changes, it is to say to change that which is attached to the root. No matter how prejudiced this word is, there is something radical in us that seeks a profound change in something. We are always radical. In this, our struggle does not stop at the doors of an abandoned airport. It goes on beyond, and as unscrupulous multinationals continue to plunder resources and spaces, we will continue to impede their machines. Without specifically wanting to leave this area which, since its future will be acquired by the anti-airport movement, can constitute a solid base to open other breaches and make solidarity exist where the state and the market separate us and isolate us. Of course, the abandonment of the airport project, if confirmed, will sound like a victory. This will send a message to all the other people and collectives in the struggles: states and multinationals are not at all powerful. We do not have to accept and suffer all their desires. We can say No if we organize to push them back. Our struggles can be victorious. Nevertheless, we very much think on this zone that the abandonment of the airport only constitutes a partial victory. While we are trying to prevent the construction of an airport, more than 400 others are being planned or built around the world. As we declared, No airport, we mean neither here nor anywhere else, that of Nantes-Atlantique will still be enlarged, disregarding any consideration for climate change and its effects which are already very noticeable. Of course, the project is about to be buried, but the world that wanted it is still running large and will continue its predatory work. It would be a pity that the amazing collective force that was forged by hundreds of Committees and thousands of individuals involved in this struggle would die out. We will still have to fight together to preserve and maintain margins of freedom, here and elsewhere. As zones to be defended, and there are thousands of them. I am now not positive the place you are getting your information, however good topic. I needs to spend a while finding out much more or figuring out more. Thank you for fantastic information I used to be on the lookout for this information for my mission. you are in point of fact a good webmaster. The web site loading velocity is incredible. It sort of feels that you are doing any distinctive trick. Also, The contents are masterwork. you have performed a fantastic job on this matter!